ADDIS ABABA/PARIS (Reuters) - At the headquarters of the Ethiopian Civil Aviation Authority, a paper sign balanced above room 107 and a threadbare square of carpet welcome a stream of foreign visitors to the Accident Investigation Bureau. The office - with three investigators and an annual budget of less than 2.5 million Birr ($89,000) - is leading a multi-party, multi-nation probe into what caused an Ethiopian Airlines flight to crash on March 10, killing all 157 people on board. Brusque foreign investigators in cargo pants and Ethiopians in suits or reflective vests wave away questions from reporters on how their inquiries are progressing. This modest agency is under intense international scrutiny because the results of its investigation could have far-reaching consequences for the global aviation industry. If the investigators highlight flaws in the 737 MAX 8 that echo a recent crash of the same model in Indonesia, their report could deal a major blow to Boeing, the world's biggest planemaker and a massive U.S. exporter. But if investigators find Ethiopian Airlines fell short in maintenance, training or piloting, that could damage one of Africa's most successful companies, a symbol of Ethiopia's emergence as a regional power. Disagreements have broken out in Addis Ababa between Ethiopian authorities and foreign investigators over issues including the handling of evidence and crash site management, according to several sources close to the investigation. Kevin Humphreys, a former Irish regulator who founded the country's air investigation agency, told Reuters the high stakes involved tend to make probes like this one particularly tough. "There are tensions because it is unrealistic to assume that international protocols are always going to work. There is a potentially important economic impact from such investigations." An 18-strong team of American investigators has been sent to aid the Ethiopians with the inquiry, including representatives from the U.S. National Transportation Safety Board (NTSB), Boeing, and the Federal Aviation Administration (FAA), which certified 737 MAX planes as safe. U.S. and some other foreign investigators are unhappy because Ethiopia is so far sharing only limited information, the sources said. "There is no opportunity for the international community to benefit and learn from this," said one of them, speaking on condition of anonymity because of the sensitivity of the matter. Some foreign officials are also unhappy about the prominent role Ethiopian Airlines played in the probe, suggesting a possible conflict of interests, they said. But one Addis Ababa-based source said the carrier's role in the investigation does not necessarily indicate it is trying to exert undue influence. The airline is more likely involved because it is the most well-funded and staffed state enterprise able to help the over-stretched inquiry team, he added. "When you have a vacuum, someone has to fill it," he said. Ethiopian Airlines' spokesman Asrat Begachew said the carrier was supporting the investigation. "We are not taking the lead," he added, declining to comment further. Under global aviation rules, interested parties like airlines and manufacturers are discouraged from speaking publicly about the investigation. Yet in the first days after the Flight 302 crash, Ethiopian Airlines made all of the public statements, including announcing the black box recorders would be sent overseas for data extraction. It was not until six days after the tragedy that the Ministry of Transport began briefing the media and public. 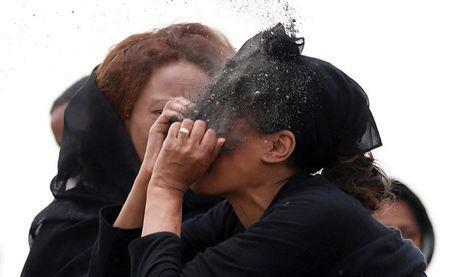 Hours after the crash, Ethiopian Airlines tweeted a picture of its CEO Tewolde Gebremariam holding a piece of debris in the crater of the crash site, surprising aviation experts who said the site should have been preserved for investigators. Musie Yehyies, spokesman for Ethiopia's Ministry of Transport, said the government had been quick to share information about the crash. He denied there was any mistrust between the Ethiopians and other parties. "Our friendship with the United States is obvious," he told Reuters. "Plenty of governments have been offering assistance, and some of them have helped practically." The ministry did not respond to requests for comment on the airline's role in the investigation or any potential conflict of interest. Ethiopia's Accident Investigation Bureau and civil aviation authority, which fall under the transport ministry, declined to comment on the investigation or any grievances of parties involved. Boeing, the FAA and the NTSB also declined to comment. The cockpit voice and flight data recorders were recovered the day after the crash, but it took Ethiopian investigators three days to decide where to send them for the information to be extracted and decoded. Like many fast-growing players, the Ethiopians do not have the technology to perform the task. In a sign of the distrust between the parties, the Ethiopians turned down an American offer to perform the analysis in the United States, according to two sources. U.S. authorities declined to comment. Ethiopian Airlines CEO Tewolde personally approached German authorities to request to send the black boxes to Germany to have the data extracted there, a separate source with knowledge of matter told Reuters. Airlines are not usually involved in such decisions, according to current and former investigators. The airline could not comment on the investigation, a spokesman said in response to questions about the incident. However German officials said they too did not have the most recent software needed to extract the data, so the devices were eventually sent to France. Partial data from the flight data recorder was shared informally late on Monday with U.S. and French investigators in Paris, but nothing from the cockpit voice recorder, three sources familiar with the matter said. It is common for the host investigator to closely guard voice recordings to protect privacy but unusual for relatively little data to be available a week after being downloaded. "As an investigator, it is hard to understand the logic behind withholding safety-of-flight information," Greg Feith, a former senior air safety investigator with the NTSB, said on Facebook on Thursday. Ethiopia said on Thursday it had begun analyzing cockpit data and was working with U.S. and European experts. Following Ethiopian Airlines' last major crash, outside Beirut in 2010, an investigation led by the Lebanese and to which France contributed blamed crew mismanagement of the aircraft and poor communication in the cockpit. The airline - led by the same CEO as today - said the report was "biased, lacking evidence, incomplete," pointing to evidence of an explosion on board. Most crash investigations end up pinpointing a combination of factors. For decades, reconstructions by independent investigators have been credited with reducing air accidents to record low levels. The system of co-operation works by sticking to technical details and avoiding blame or other agendas. Safety experts worry that too many turf battles can cloud the progress of an investigation. "The sole purpose of an accident investigation is to reduce the chances of something ever happening again," said Paul Hayes, safety director at the Flight Ascend Consultancy. The Flight 302 crash triggered the global grounding of Boeing's 737 MAX jets, wiping billions off the company's market value. Also on the line are more than $500 billion worth of 737 MAX orders. Ethiopian Airlines is regulated by the country's civil aviation authority, but its resources are far more extensive. The carrier's operating revenue in the 2017/18 financial year was $3.7 billion. This dwarfs the regulator's budget, which is 360 million Birr ($12.5 million) for this fiscal year. Responsibility for leading the probe fell to Ethiopia because the crash occurred on its soil. Nairobi-bound Flight 302 went down into farmland minutes after take-off from Addis Ababa. The crash killed people from 35 countries, all of which are also entitled to examine the crash site and join in the investigation. America, China, Kenya, Britain, Canada, Israel, France and other nations have sent investigators. Some nations were unhappy that Ethiopia was using heavy earth-moving equipment at the site, potentially damaging evidence or human remains, although others said that was the only way to move heavy items such as engines. Some foreign officials also complained of being unable to access the site in the days after the crash. After Israel's team were not given permission to visit the site, the Israeli prime minister eventually called the Ethiopian prime minister on Wednesday, a statement on the Israeli prime minister's website said. A permission letter - from Ethiopian Airlines - was issued late on Thursday for the Israeli ambassador and emergency response unit ZAKA, a source familiar with the incident added. The European Union's aviation safety agency, EASA, waited more than a week to be allowed to join the crash investigation. "The Ethiopian investigation body is very keen to keep a very, very closed circle around the investigation," EASA Executive Director Patrick Ky told the European parliament on Monday.